Would you like to know when exactly the best hunting times occur? 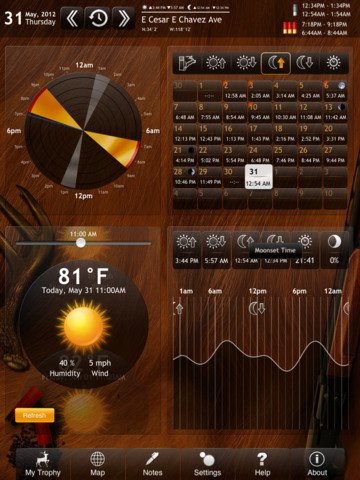 Hunting Aid helps you plan your trips and predict specific days and times for best hunting success. How does it work? Best hunting times are calculated based on the information about the Moon and the Sun. Always know best hunting days and specific times with Hunting Aid application! Best days for hunting are shown right on the calendar - the longer the bar, the better chance you have this day to get a trophy. Tap on the buttons on the top to show sunrise and sunset times, day length or moonrise and moonset. Double tap on a day will add a note in the calendar. The best times for hunting during the day are shown next to an icon with three red shells. One shell icon shows just good times for hunting. Tap on the icons to see the times on a clock. Hunting time chart shows the probability of hunting success during the day. The higher the value on the chart, the better chances you will have to get another trophy. Store all your trophies and their pictures on the map. If you would like to mark your favorite spot, tap on "Map" and place a label. Add multiple pictures of your trophies, notes and weather condition to the selected label. Later you can share your trophy pics via email. ✓ Sunrise and set times. ✓ Length of day on the calendar. ✓ Moon rise and Moon set times. ✓ Moon phases for each day on the calendar. Check the weather and store it in the trophy form along with the pictures of your trophy. To get more accurate weather forecast select a specific time using a slider. Always have a powerful flashlight handy: adjust brightness, blinking interval or flash text using Morse code. Add labels to the map and select your location - simply tap on the coordinates. All features work anywhere even without internet connection. Enjoy this hunting app in all tough to reach places! If you like Hunting Aid, please write us a review on iTunes to keep free updates coming. Your support would greatly help us make the application even better! If you have any problems with installation or in-app purchase, found bugs, questions, comments about this application, you can visit the official website of Sergey Vdovenko at http://www.lifewaresolutions.com.